CompSci.ca is moving onto a dedicated server. This means that this blog, forums, and other projects will run blazingly fast as soon as they move out of the crowded shared host. This also means that we need to start thinking about our own off-site backup system. That happens to be located in Dan’s basement, Thunder Bay, Ontario. Trying to keep ourselves “could-get-hit-by-a-bus proof” has brought up a discussion of an unlikely scenario of Dan going to our data centre for a tour, and a bus running into a building, simultaneously taking out both our server and the unfortunate system administrator who keeps all the backup data. Ouch. Fortunately I will remain intact, yet frustrated about /blog’s downtime. Waterloo, Ontario. 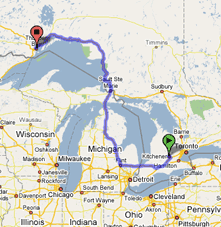 University to University, Google says there are 1,476 kilometers of road in between us, suggesting a 16 hour drive. Assuming speed limit, caffeine pills, and having the 500 GB external hard drive be full of useful data (lets say backup files and personal media), it was interesting to figure out the effective bandwidth of such a road-trip. The math is disappointingly easy. My broadband Internet peaks out at about 4,500 kilobits per second, making this ridiculous road-trip have an effective bandwidth 8 times higher than what my DSL modem could possibly pull in. Outrageous! I demand to have fiberoptics installed. HAH, Awesome! However, I can’t help but notice that if you took the Chi-Chi-Maun ferry across from Tobermory to Manitoulin and continued on from there, you’d be able to cut your distance down -significantly- (and possibly save a ton of time) while avoiding going through customs as you’d apparently have to according to your map. Perhaps a way to increase your bandwidth? Google maps obviously still has room for improvements. It’s a wonderful strategy though, not only for enhancing the bandwidth, but also for avoiding the customs and possibly RIAA. Who knows what arrangement of bits that disk might contain? Thx for the tip! Yeah, but hows the latency? Btw, the dedicated server is great news. Dreamhost is great and all but you can only do so much with a shared host. @Aziz – at 44 mpg (highway mileage), my Matrix would consume 190 L of gas in a round trip. Lets say call this a $200 request. That’s 4 times as expensive as a monthly broadband subscription, but as I’ve concluded above, this particular transfer will still be 8 times as fast if I was to drive. How important is the data? This is all well and good, but I think you’re forgetting about the land mines.